Lease Purchase – New Equipment, No Forced Dispatch, $10,000 Longevity Bonus And More In The Houston, TX Area! We are a family-owned trucking company that has been in business since the 80’s. 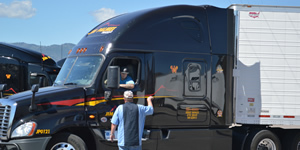 We’re truckers, and we know how to help you run a profitable business. We leverage the nation’s largest refrigerated freight network to ensure that we have the freight to keep you running, and we have the best equipment on the road! You can only do your best in the best equipment. We have 2017-2018 Peterbilt 579’s and Freightliner New Cascadia’s. Lease purchase operators earn a percentage of each load and 100% of the fuel surcharge. Get on your way to starting your career as a Wilson Logistics driver by applying today! CALL 877-775-9975 TODAY!